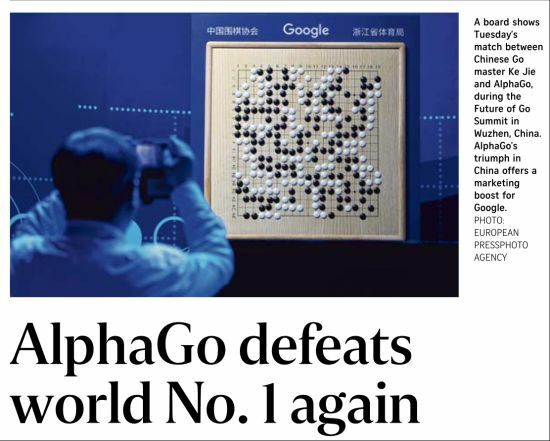 This picture will immortalize the human defeat of Weiqi at the hands of Artificial Intelligence. It will however not defeat the human spirit or possess the values to create Star Trek. It can be smarter than us but not wiser. It will force us to stop our foolishness but it can't itself become wise. In other words it will always need human leadership. Algorithms however impressive are simply only mimicking us better than ourselves. As in the past, we will use our creations to learn about ourselves. To do that we must not make AI serve us but work with us by sharing the load. This will free up time and energy which we will then experiment and create the next work place and economy. The problem is that we can't visualize what that future would be like yet. At least we must commit to not doing harm to each other with this technology but keep trying until they are used to do good.